If you still have a problem, the alarm will re-propagate so I haven’t seen the downside. This entry was posted in Avaya, Avaya Stuff You Should Know on December 1, 2014 by roger. As usual, the solution is simple once you know it. You can clear the message waiting indicator with “clear amw all xxxx“. This clears the messages flag (not the messages!) and turns off the message waiting indicator. This allows you to remove the station. This entry was posted in Avaya, Avaya Stuff You Should Know on June 9, 2014 by roger. If you have an Avaya telephone system, you probably have a web server to manage firmware. If not, it’s pretty easy to set up so let me know if I should post the procedures. What is not easy is testing firmware before deploying it to the whole network. What if you just want to update one particular phone? What if someone is complaining about something (e.g. continuous reboots) and you want to update their firmware to see if it fixes it? You could set up a development web server and statically assign the file server address to the phone. But then you have to statically assign all addresses on the phone or the DHCP server will overwrite the file server address. And this isn’t a permanent fix because the phone will forever have a statically assigned address. You could do tricky things in Apache using the IP address of the phone in the http.conf file or .htaccess, but there’s another way. This is the stuff Avaya put in the sample file so individual types of phones can download different versions of firmware. Note how there’s a check against a “$MODEL4” variable? This allows the phone to jump to a new section after a very basic check. Unfortunately, there are only a few variables available. I’ve never been able to find a definitive list of all available variables, but we can make this work with the GROUP variable. This just tells the phone to check its firmware version and if it’s already 3_1_03_S, then go to PHONEAPP96XX. If not, set its version to 3_1_03_S, which will cause the phone to download the new file, reboot, write it to flash, and reload the 96xxupgrade.txt file. Then when it gets to this line, it will have the version 3_1_03_S and jump to PHONEAPP96XX. Why is there a goto GETSET? Well, that’s there in case the phone cannot find the file. It will just jump to GETSET. Maybe yours does too. This just sets the application file to the right name. Again, causing the phone to load the file, reboot, write to flash, and reboot again. Then when it gets to this section, it jumps to GETSET. When you download new firmware, the phone reboots four times as it works through all these files. And this again is an Avaya default. I don’t have any 4600 series phones. I guess I should rename mine to 96xxsettings.txt. But it doesn’t matter. The settings file contains tons of options. Tons. So the phone will jump to a new section of the file and load specific firmware based upon its GROUP variable. Note that you can also “goto GETSET30” for example if you wanted to load a different settings file for this phone. In my case, I just want to test version ha96xxua3_2_0_S of firmware. This method will “follow the station” so if you log a new extension into the phone, the GROUP will follow the new extension and will likely change. Then when the phone reboots, it will load new firmware. If you log your extension into another phone and then reboot that phone, it will load new firmware. 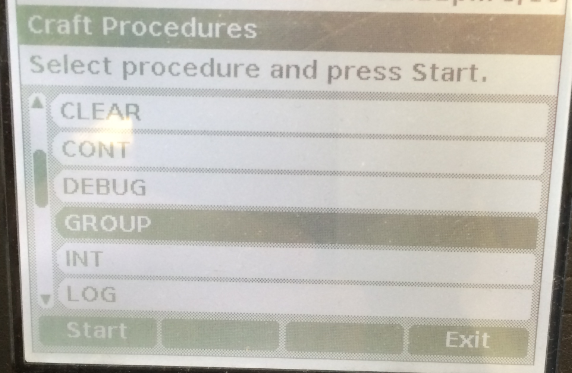 Method 2 – The “GROUP” menu item on the config screen of the 9630 telephone (Usually accessed by pressing Mute-CRAFT-# on the 9630, or pressing *-CRAFT-# at boot-up). This method will “follow the phone” so if you log a new extension into the phone, it will retain the phone’s setting. However, it gets over-ridden by the station’s group if there is one. Interaction gets complicated. I always use the station form. And lastly, this is how we load SIP firmware in the 9630 using the same network and DHCP server we already have. We can check the value of the SIG variable, which is set in the CRAFT menu. But that’s a different post. For now, I hope this helps and I look forward to hearing from you. This entry was posted in Avaya, Avaya Stuff You Should Know and tagged avaya firmware 96xx on May 16, 2014 by roger. There are tons of documents that describe the firmware update procedures for the Avaya circuit packs and media modules. This document is meant to be simple, and as I often do for these posts, it’s is also written for myself for future reference. I have found that I update firmware just a few months after I’ve forgotten how to do it. I will assume you know what firmware to load. There’s a hard-to-find matrix on support.avaya.com that will tell you and I’ll include this procedure in a future post. For now, let’s say you have the firmware you want for your card. This post is for the TN799DP (C-LAN) cards but the procedures are similar on other cards as well. The current firmware version. “list config all” will tell you these first three. The IP address of the C-LAN. “list ip-interface clan” will tell you this. The username and password you will use for file transfers. This is temporary – File transfer will get disabled automatically when you’re done so don’t worry about crazy passwords. The exact filename of the firmware. At the time of this posting, I want those C-LANs to say FW043. Note there’s a special case with C-LANs. I have one at hardware version HW01, and one at hardware version HW16. There are two different version 43 firmware files for these! From the CLI, type “enable filexfer” and fill out the form. If file transfer is already enabled for the board you want, you may need to disable it and re-enable it. If there are files already on the board, you will need to remove them. You can “list directory board xxxx” to see the files, and “remove directory board xxxxx” to remove them. Then you can disable the filexfer and re-enable it with the password you want. Use whatever file transfer method (WinSCP, ftp, ssh, sftp, etc) to move the firmware file to the card. When it’s done, you can “list directory board xxxx” to make sure the file transferred correctly. Avaya is very good at confirming the file transferred correctly and is appropriate to your card. In my humble opinion, Avaya’s deep roots in telecom have made this process smooth. It’s designed for remote work and verification. Of course now I have jinxed myself and will brick-a-clan tonight when I update my system. This is the part that affects service. If your C-LAN is serving any phones (“status socket” to see), then you should wait until after-hours. C-LANs serve 400 phones maximum, so you could disable phone registrations on the C-LAN after hours and update the card mid-day if you’d like. If you “change ip-interface xxxxx” you’ll see a parameter called “Allow H.323 Endpoints”. The scary part is you have to set “Enable Interface” to N before you can change that. The first time I did this, I was worried that I wouldn’t be able to manage the C-LAN but don’t worry – you are managing it via the G650 backplane so you can disable the interface and still manage the card. Open a separate command prompt and continuously ping the C-LAN’s IP address. Now type “change firmware download 1” and fill out the form. For the source board, use your C-LAN, file server is “none”. The image file name is the exact name of your firmware file including the “.bin” extension. The target board codes is TN799 and the Suffix is DP. Vintage is blank. I never schedule the updates, so I say “n” to schedule. According to my docs, the C-LAN can only be updated from its own file system, so you might as well “Remove Image File After Successful Download” so you don’t have to delete it yourself (this also disables file transfer for you). The target location is the same as the Source Board Location (i.e. itself), and submit. 1. 01a05       11. 21. 31. 41. 2. 12. 22. 32. 42. 3. 13. 23. 33. 43. 4. 14. 24. 34. 44. 5. 15. 25. 35. 45. 6. 16. 26. 36. 46. 7. 17. 27. 37. 47. 8. 18. 28. 38. 48. 9. 19. 29. 39. 49. 10. 20. 30. 40. 50. Now wait. At some point the pings will drop then come back. You can check the status of the update with “status firmware download 1”. The status code will be Pending, Complete, Failed, or Aborted. If failed or aborted – check the documentation for the reason code. If you’re like me, you have tons of PDFs of Avaya documentation in your hard drive. I end up using Google anyway. You should see “Pending” for the download state. Soon your pings will drop. It takes a few minutes. In my experience it will take just long enough for me to panic, plus 30 seconds. Not worried, but actually concerned. After 30 seconds of “oh crap I’m going to have to drive the site”, the update completes. I have noticed the HW01 vintage was MUCH slower than the HW16. If you have a lot of updates and trust the system, you can run these in parallel with “change/status firmware download x” where x is between 1 and 4. So you can have up to four firmware updates running at a time. I’ve done it – it works. And by the time you’re done with the fourth one, the first one is probably done. When the update is done, the “status firm down 1” will blank out. When you “list config” you should see your new firmware version. However, the ping did not come back! I am embarrassed to say I panicked. I did a “busy board” If you disabled the ip-interface then enable it. Type “status sock” and check for registered phones. Phones should move back to it as the CM balances the traffic. you can also disable other ip-interfaces momentarily to encourage phones to move to it immediately. What if the ping doesn’t come back? Strangely, the ping doesn’t stop when you disable the ip interface. But once the firmware is done loading and the “stat firm down 1” shows nothing and the “list config” shows the right SW version, what if the pings still timeout? Well first, give it a good long time. You really need to panic before the firmware will finish. If that doesn’t seem to work, then “change ip-i xxxxx” and enable the ip-interface. The pings respond? Mine did. If yours don’t, you can try “busy board xxxxx” then “release board xxxxx”. That always works for me. If it still doesn’t work, Avaya would probably recommend pulling the board and re-seating it. There are a bunch of test procedures though. I assume performing a busy/release would Abort if you try it while the firmware is loading, but I don’t want to try. Let me know if you do it. That’s it. The first time is scary, then it gets easier. Especially since this is done so infrequently that, as usual I start to forget the exact procedures. Good luck all and let me know how it goes. Thanks as always, Roger. This entry was posted in Avaya, Avaya Stuff You Should Know and tagged Avaya, C-LAN, CLAN, firmware on May 1, 2014 by roger.